The recognition of our sinfulness ought to awaken our conscience and a healthy feeling of guilt within us. The mystery of the wickedness of sin is partially unveiled in the passion and death of the Lord Jesus. How horrible sin must be if the Son of God Himself suffered so cruelly to undo it! His love and mercy obliges us to fight with all temptations to avoid committing sin. We can’t ignore sin. Sister Faustina was aware of the need for confession, Jesus said in her Diary: “Come close to My wounds and draw from the fountain of life whatever your heart desires. Drink copiously from the fountain of life and you will not weary on your journey. Glorify My mercy” (Diary 1485). According to the Diary, by making confession we dwell in the shelter of the two rays, the pale one and the red one. (Diary 1588). The Holy Father John Paul II wrote that in this sacrament each person could experience mercy in a unique way, that is, love which was more powerful than sin. Many times in my priesthood I have seen people who, through making confession, experienced a power which enabled them not to repeat habitual sins. Beforehand they tried hard not to give in to temptations. Despite great efforts they felt helpless and were still addicted. But Jesus, present in the sacrament of reconciliation, set them free. Of course we have to deal with many moral illnesses and weaknesses over a long period of time. It takes time to heal them. Changes do not occur overnight. But when we cooperate with God’s grace and do our best, over a period of time we will notice these changes. The fruit takes time to grow. Having confession multiples the grace of healing, we deepen our relationship with Jesus. It is so in human relationships. When we go to the doctor frequently we build a kind of relationship with him. When we meet Jesus present in the confessional we develop our friendship with the Son of God. One day Jesus said to Sister Faustina: “If it were not for this imperfection you wouldn’t have come to me”. I assure you of the constant prayer of the priests of the Congregation of Saint Michael the Archangel for all the readers and their families. 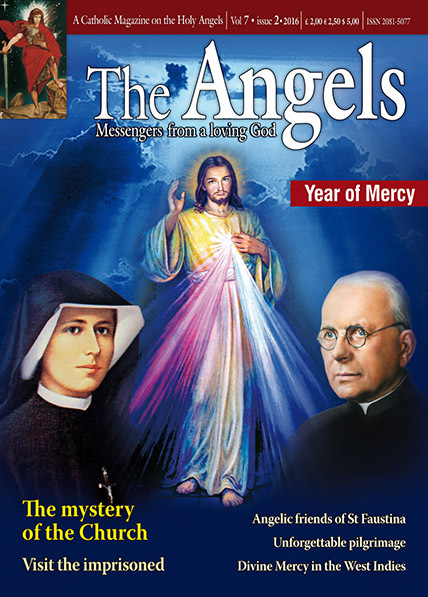 We also pray that this magazine helps us all to be in touch with these spiritual beings, messengers from a loving God.